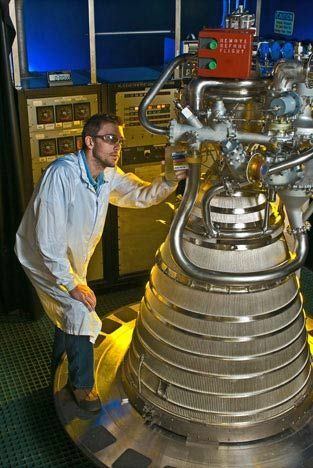 A Pratt & Whitney Rocketdyne technician examines the liquid hydrogen-fueled RL-10 engine, which powers the upper stages of the Atlas 5 and Delta 4 rockets. WASHINGTON? The U.S. Air Forceis beginning to weigh options for developing a more capable andaffordableupper-stage engine for the Atlas 5 and Delta 4 rockets the service usestolaunch most national security payloads. TheAir Force Space and MissileSystems Center in Los Angeles is giving industry until Nov. 9 to submitideasfor building a next-generation upper-stage engine to replace by 2017the twoversions of the RL-10 engine Pratt & Whitney Rocketdyne buildsfor theAtlas 5 and Delta 4. Aformalrequestfor information the Air Force posted Sept. 27 on the FederalBusinessOpportunities website has garnered the attention of Pratt &WhitneyRocketdyne and its rival Aerojet, the other main U.S. producer ofliquid-fueledrocket engines. Originallydeveloped under theAir Force's Evolved Expendable Launch Vehicle (EELV) program ascompetingrockets, the Atlas5 and Delta 4 boosters are operated today by United LaunchAlliance ofDenver, a Boeing-Lockheed Martin joint venture. The rockets useslightlydifferent versions of the liquid hydrogen-fueled RL-10 engine to powertheirupper stage. While the engine has evolved over the years, Pratt& WhitneyRocketdyne officials say engineers are reaching the limit of additionalimprovements that can be squeezed out of the 50-year-old engine design. TheAir Force plans to continueto rely heavily on the EELV rockets until at least 2030, and theservice wantsto have a new upper-stage engine produced and qualified by 2017 thatuses thesame cryogenic fuel as the RL-10, according to the Sept. 27 posting. Theproposed next-generationengine "would use modern design and manufacturing methods. It isexpectedthat the new engine will demonstrate state-of-the-art operating marginandreliability and minimize life-cycle costs," the posting said. TheRL-10B-2 engine used in theAtlas 5 vehicle is more capable than its Delta 4 counterpart, theRL-10A-4-2.The Atlas variant produces 24,750 pounds of thrust and has a specificimpulse ?a measure of the engine's efficiency ? of 465.5 seconds. TheAir Force would like the next-generationengine to be as efficient as the current Atlas design andproduce between25,000 pounds and 35,000 pounds of thrust, the posting said. CanogaPark, Calif.-based Pratt& Whitney Rocketdyne has encouraged the Air Force toinvest in new engine development as a way to drive down theever-increasingcosts of the EELV program. "Wecertainly have beenadvocating the need to go to a next-generation engine, not because webelievethe RL-10 is necessarily a bad engine ? it has a tremendousdemonstratedreliability and has flown more than 500 times ? but it's based ontechnologythat was formed in the late '50s and early '60s," said Steve Bouley,Pratt& Whitney Rocketdyne's vice president for launch vehicles andhypersonicsystems. "Wesee an advantage inmaking an investment now to go to a next-generation engine and leveragetheability to have the same kind of reliability and performance as aminimum andreduce the cost, improve the manufacturability and leverage the historyof theRL-10," he said. Pratt& Whitney Rocketdyne inrecent years has invested some $40 million in new technologies such asturbopumps and new engine chamber and ejector designs, and it has presentedthe AirForce with a roadmap for moving to a next-generation enginedesign, Bouleysaid. Theother primary U.S. developerof liquid-fueled rocket engines, Aerojet of Sacramento, Calif., alsoplans torespond to the Air Force's request for information. "We'repleased that advancedcapabilities are being evaluated," said Julie Van Kleeck, Aerojet'svicepresident for space and launch systems. "We think anything to furthertheU.S. propulsion capability in terms of using modern manufacturingprocesses isa positive." Morethan improved performance,Van Kleeck believes the Air Force is most interested in developing anenginethat will be more affordable while retaining the same level ofreliability asthe current designs. "Oneof the things that ispretty clear within the industry is affordability is what we will allbe livingwith and having to treat as the key criteria for any decisions that getmadegoing forward," she said. "As a company, we've been working on ourcompetitiveness and affordability for quite some time, leaning out theoperation and reducing the footprint, and so on. ? We think there aresomeadvances in technology that can improve the affordability androbustness inthis product." Pratt& Whitney Rocketdyneand Aerojet face a measure of business uncertainty because both aredevelopingpropulsion systems for NASA's Constellation program, which the WhiteHouse istrying to cancel. Pratt& Whitney Rocketdyne,for example, has been developing the J2-X engines that would power theupperstages of the Ares 1 and Ares 5 rockets, and Aerojet has beendevelopingmultiple propulsion systems for the Orion crew capsule and escapesystem. AirForce spokeswoman LaGinaJackson was unable by press time to provide further schedule andfundingdetails related to the next-generation engine efforts.